The 50th anniversary episode of Doctor Who was excellent. I could have asked for them to reduce some of the gratuitously cheeseball scenes, but by and large it followed through on its promise of revisiting the Doctor’s darkest day during the Time War quite well. We took the kittens to the vet yesterday for their annual check-up. At 14 months, they’re not really kittens anymore, but we still call them that, and probably will for a while. We also brought Roulette for her check-up. In the past she always rode in our large carrier with her brother Blackjack, but since he passed away just about a year ago, we decided to put her in a small carrier by herself and put the kittens together in the large carrier. Result: Roulette meowed the whole drive, and Sadie meowed from time to time and even louder than Roulette. Jackson was completely blasé about the whole thing. In fact, Jackson was perfectly happy at the vet: He came out of his carrier, tail straight up, and checked out everything in the office, and was perfectly pleasant to everyone he met. Other than a brief yowl when his temperature was taken, he was quite comfortable in this new place. He really is the alpha cat, I guess! We also learned just how enormous a cat he is, which is to say, not as enormous as we’d thought: He weighed in at 14-1/2 pounds, well under the 16 pounds I’d guessed, and even the 15 that Debbi guessed. He’s about the side Jefferson was when Jeff wasn’t getting pudgy. Sadie was also pretty comfortable at the vet, but Roulette was not, and had to be pulled out of her carrier for her exam. And afterwards she jumped down and went into the large carrier and curled up. So we decided to have her and Sadie ride home together, since they get along pretty well (it’s Jackson and Rou who don’t get along – specifically, Roulette does not like Jackson). Putting the girls together worked great, as everyone was relatively quiet on the ride home, and Roulette was even up and looking around during the ride. When we got home we let them all out and the three sort of followed each other around looking a little dazed by the experience, without any friction between Jackson and Rou. So maybe there was a little bonding that went on during the trip. The adventure took a lot out of them as they slept most of the rest of the day. Oh yeah: And they’re all healthy, which was the point of the trip in the first place. I used to think I’d been watching Doctor Who longer than almost everyone in America. Then a friend pointed out to me that the two 1960s movies with Peter Cushing, Dr. Who and the Daleks and Daleks’ Invasion Earth: 2150 A.D. had been released in the United State, so a lot of science fiction fans from that era were familiar with the character. Oh well! Still, I’ve been watching the series since the Tom Baker episodes aired in Boston in 1976 (I was 7), and I have dim recollections of watching my Dad watch a couple of Jon Pertwee episodes circa 1974, so I’ve probably got a few years on anyone who didn’t see those films in the 60s. As with Star Trek, I spent my pre-teen years watching them over and over and over again; compared to other genre shows of that era, they were clearly the cream of the crop. The pattern at PBS back then was that they’d throw the shows into rotation, and then after a few years they’d get a few more seasons of the series and add them on. So I watched the hell out of the first four Baker seasons, and then they added the last three. Then in the early 1980s we got cable TV, and I discovered a New Hampshire station that was showing the Peter Davison stories, and they weren’t airing them in their original episodic half-hour format, but were showing them as full stories, which was awesome. The first one I saw was “Kinda”, which all things considered is a pretty crappy introduction to the fifth Doctor, though in hindsight it’s actually a good story which distills the Doctor’s attitude quite well. By the mid-80s I had largely stopped watching television. Moreover, what I imagine was the BBC’s quixotic attitude towards the series combined with PBS’ cynical approach to premiering new Who episodes during pledge drives made it difficult to see many of the Colin Baker and Sylvester McCoy stories. I found a friend in high school who, it would be fair to say, was a bigger Doctor Who fan than I was, and he had access to bootlegged videotapes of the later stories which we loaned to me. Honestly, I wasn’t missing much; the original series went south in a big way after “The Five Doctors” (people who think “The Caves of Androzani” represent some pinnacle of the series are just wrong – “ham-handed” is how I’d describe it), with the exception of a few of the McCoy episodes. Still, this was my first experience (other than a convention my Dad took us to to meet Tom Baker which I barely remember) with other Who fans. It was a little weird to realize that there were fans who were more willing and able to get those episodes than I was. I was never into reading any of the spin-off books or listening to any of the audio dramas. I felt like I’d been burned by all the yahoos on USENET in the early 90s earnestly arguing that all the Star Trek novels and such were canon. As far as I’m concerned, if it ain’t in the original medium (video for Trek and who) then it’s just fanfic. I guess there’s a complex set of plots in the novels, but it’s been largely discarded by the new series, so I don’t feel that I missed much. I was encouraged when I’d heard that the new series was going to be a continuation of the old, and that they were going to treat the TV-movie as part of canon. And it’s been a fun run, though erratic at times, perhaps struggling to reconcile the series of unrelated adventures of the original series with the “larger storyline” demands of modern TV (though most series manage to flub their ongoing storylines). The series also led with its best, as Christopher Eccleston as the ninth Doctor has pretty much overshadowed every other actor in the series. As Doctor Who has become a worldwide phenomenon it’s been strange for this old fan to see some of the new conventions that have grown up around it. The weirdest for me was been people referring to the Doctors by just their number (“eight”, “ten”, “eleven”). I guess it’s a natural development in these days of texting shorthands. LOL. Also strange is how strongly Doctor Who has become identified with the U.K., since the original series just felt like a science fiction show with a low budget and English accents. So it’s been a long strange journey, and now we’re heading up to the 50th anniversary of Doctor Who next Saturday. And despite myself, I’ve been getting just as excited about it as everyone else, following the speculation and all the bits that have been released officially. I worry that I’m too excited: There’s a huge amount of potential in the premise they’ve set up, honestly they could base a whole season around it, but they’ve only got 75 minutes to work through it all. Will it be enough? Will it be ridiculously over-the-top, as the silly season-enders under Russell T. Davies were? We’ll find out. I’m looking forward to it anyway. There’s surely no comic less in need of my recommendation than this new installment (“Back After Fifteen Years!”) of Neil Gaiman’s keynote fantasy series. 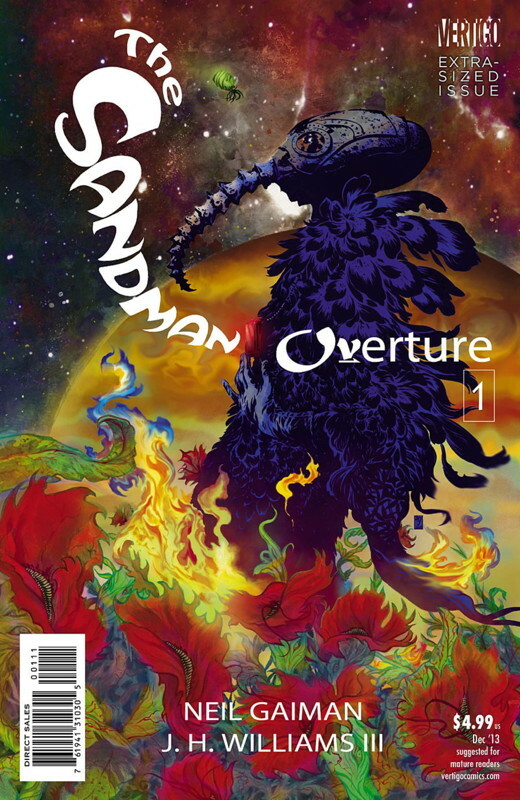 But The Sandman: Overture #1 was the standout comic this week. I was generally a big fan of the original series (I only say “generally” because I actually dropped it about six issues in, after the death-in-the-diner issue, and picked it up again with “Dream of a Thousand Cats”; also, I felt that “The Kindly Ones” was hecka padded. But it had many truly excellent stories, and worked superbly as a grand arc), so I was a bit skeptical of Overture being a prequel to the series, explaining what led to Dream being captured in the first issue of the original series. Indeed, we see many elements in this first issue which were revealed only over time in the original series (and, thus, Overture is a poor starting point for people who haven’t read the original), some of which are portents of plot threads which would be resolved in the original (a lengthy sequence with The Corinthian, for example). Joining Gaiman is artist J.H. Williams III, who is certainly one of the best renderers in comics today. Where his work often falls down, for me, is in layouts and storytelling, which I often find hard to follow. (His Batwoman had this problem in spades.) While I’m a fan of innovative layouts, they should never compromise telling a coherent story. Fortunately, he adopts a much more straightforward approach here (possibly prompted by Gaiman’s script, I don’t know), and consequently we can happily enjoy the pretty pictures. Williams also supplies the lovely primary cover (an alternate cover is by original series regular cover artist Dave McKean, whose work I’ve never warmed to). Overall it’s a winning combination, and looks to be an excellent series. So if you had some of the same reservations about it that I did, I would say that you should put them aside and check it out.